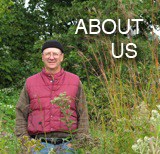 LivingLibations | September 28, 2010 | Ron explains creating gardens at the Forest’s edge: How to create micro-climates, no weeding, no digging, fruit trees in colder climates and working with the animals. That’s awesome! What a great concept!